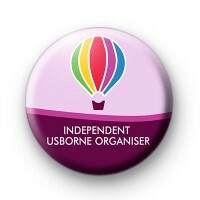 Independent Usborne Organiser badge designed for Maria at Usborne Books at home. Featuring a light pink and purple background, a hot air balloon and the text Independent Usborne Organiser text in white. Standard 25mm badge handmade in our UK workshop. If you would like a custom badge & need help with the design, please do get in touch with us.